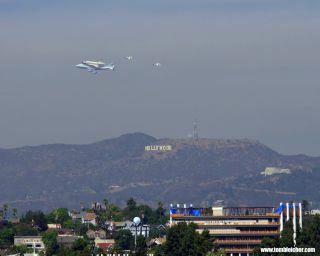 SPACE.com reader Tom Bleicher sent in this photo of shuttle Endeavour flying over Los Angeles with the iconic Hollywood sign in the background, September 21, 2012. Space shuttle Endeavour, atop NASA's Shuttle Carrier Aircraft, is seen taxiing at Los Angeles International Airport in California, on Friday, Sept. 21, 2012. Endeavour and the SCA flew over Northern and Southern California in an aerial tour before arriving in L.A., where the shuttle will go on display at the California Science Center. NASA's space shuttle Endeavour flies over Los Angeles International Airport while riding piggyback atop its Shuttle Carrier Aircraft on Sept. 21, 2012, during a4.5-hour aerial tour over California. The shuttle was being delivered to L.A., where it is destined to serve as a museum piece at the California Science Center. Space shuttle Endeavour and its carrier aircraft fly low over the California State Capitol Building in Sacramento on Sept. 21, 2012, during a state-wide tour over California on the way to Los Angeles, where Endeavour will be placed on public display in a museum. It was NASA's last-ever shuttle ferry flight. The space shuttle Endeavour atop its modified 747 carrier aircraft soars over the California high desert west of the towns of Rosamond and Mojave on the first leg of its Tour of California Sept. 21. The tour, including numerous flyovers of cities and landmarks in Northern and Southern California, would conclude with a landing at Los Angeles International Airport where Endeavour would be turned over to the California Science Center for permanent exhibit. Space shuttle Endeavour takes off from Edwards Air Force Base near the Dryden Flight Research Facility in Southern California for its final ferry flight, a sightseeing trip over California, before arriving at its new museum home in Los Angeles on Sept. 21, 2012. The Shuttle Carrier Aircraft takes off with shuttle Endeavour on its back from Edwards Air Force Base, California, on September 21, 2012. A close-up of NASA's space shuttle Endeavour riding atop its Shuttle Carrier Aircraft just after landing at NASA's Dryden Flight Research Facility near Edwards Air Force Base in Southern California on Sept. 20, 2012. Endeavour is headed to its final museum home: the California Science Center in Los Angeles. NASA Social Media tweeted this photo on September 20, 2012, and wrote: "Welcome to sunny CA Endeavour! #OV105 #spotheshuttle #NASASocial pic.twitter.com/ounZKuJz."